I started this blog post on July 1. ‘Bout time I finished it, eh? It arrived in the mail! My signed copy of Drawing Lab for Mixed-Media Artists by Carla Sonheim. I was so fortunate to have Carla as a teacher at Artfest this spring. And that is as far as the blog post went. But last night, after a very busy day of work and a lovely dinner with my homeschool moms, I was exhausted and still hadn’t created any art! 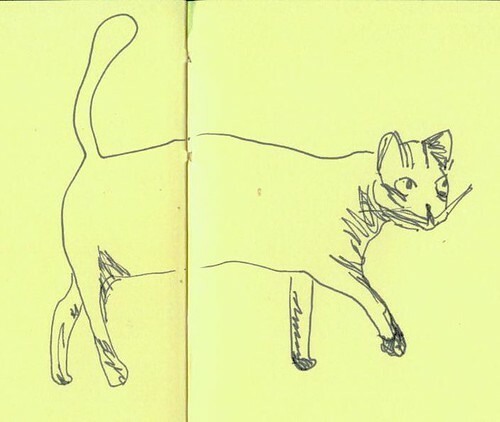 I remembered Carla’s awesome book and took the opportunity to do her first exercise: drawing cats in bed. 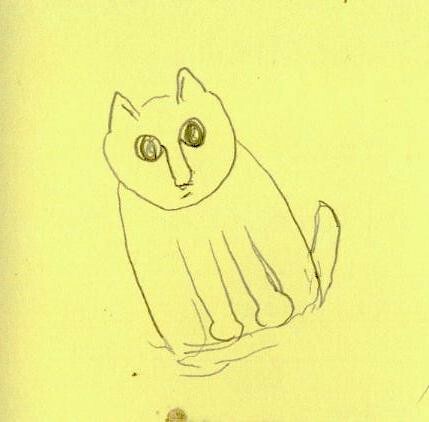 Well, it was actually drawing a cat in bed. This simple sketch was the last thing I saw before I fell asleep. It’s officially my Day 9 Art. This is the “I’m hungry. Wake up and feed me” stare down that our cat often gives. And yes, her tail really is that short. Today has been another very busy work day. My husband and I run a video production company, he being the amazing videographer and I, his business manager. Today was one of planning and meetings, keeping our business goals and focus on track. My mind is fried. This long-bodied kitty with the bulbous tale I’ve named the dachshund kitty. 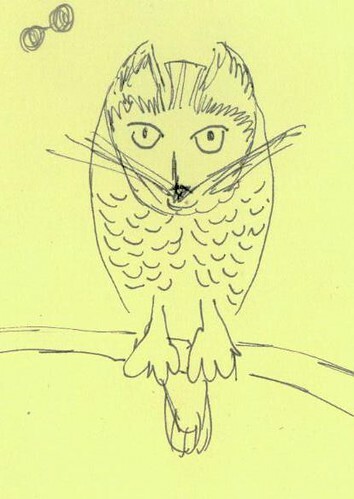 And the one below just somehow turned into “kitty owl.” Kitty owls are great mousers with a playful side. And that silliness concludes Art Every Day Month – Day 10.